Former CIA Director John Brennan issued a tweet on Sunday accusing the President of When the full extent of “venality, moral turpitude, and political corruption” and predicting will take his, “rightful place as a disgraced demagogue in the dustbin of history.” Brennan probably took those words from his autobiography because, while they do not apply to the President, a corrupt lack of morality is a fitting description for John Brennan’s tenure in the Obama administration. The FBI’s OPR accused Andrew McCabe of not being honest and for leaking information. A bit of research proves that when working for Obama, Brennan wasn’t honest and leaked information— it’s no wonder why Brennan freaked. For example in March 2014, the then-chairman of the Senate Intelligence Committee Sen. Dianne Feinstein (D-CA) tore into Brennan on the Senate floor for spying on her fellow senators. The man who accuses others of a lack of morality was interviewed by Democratic Party sycophant Andrea Mitchell and denied the charges. “We weren’t trying to block anything,” Brennan said. “The matter is being dealt with in an appropriate way, being looked at by the right authorities, and the facts will come out,” he added. As Obama’s counter-intelligence adviser, one of Brennan’s responsibilities was a program designed to make up for Obama’s premature withdrawal from Afghanistan, sending unmanned drones to kill terrorists and their leaders. Several missiles fired from American drone aircraft on Thursday struck a meeting of local people in northwest Pakistan who had gathered with Taliban mediators to settle a dispute over a chromite mine. The attack, a Pakistani intelligence official said, killed 26 of 32 people present, some of them Taliban fighters, but the majority elders and local people not attached to the militants. As the counter-terrorism adviser Brennan even lied about when our Seal Team Six heroes killed Bin Laden. “I turned to the right and looked into an adjoining room,” he said. “Osama bin Laden stood near the entrance at the foot of the bed, taller and thinner than I’d expected, his beard shorter and hair whiter. There was no firefight with Bin Laden that was another Brennan lie, the terrorist went out like the coward he was. Brennan was a vocal opponent of government leaks, like the time he spoke at a 2012 Council on Foreign Relations event. He said ” that some recent leaks of national security secrets have done serious damage, but he also lashed back at critics who have charged that President Barack Obama’s White House staff is responsible for the breaches? But during his tenure in the Obama administration, Brennan himself was accused of leaking to the press, “John Brennan has not been absolved of responsibility for the slew of high-level security leaks that have characterized this White House,” Senator Cornyn (R-TX) in 2013. “There should be an investigation of what the Russians did, but also John Brennan and the hit job he seems to be orchestrating against the president-elect,” Donald Trump, King said. “I’m not saying it didn’t happen,” that Russia interfered in the election to help Trump. “I’m just saying we’ve been given no evidence on it, when we have these stories mysteriously appearing in the newspaper,” King said. Former CIA analyst Tony Shaffer also suspects Brennan as one of the leakers. He said on Fox Business Network that the leaks which forced Michael Flynn out can be laid “squarely at the feet of” Brennan, among other embittered Obama aides. What we know is that intelligence agencies taped Flynn’s call with the Russian ambassador, and we know that the contents of the call were leaked to the Washington Post’s David Ignatius, who is a de facto stenographer for political liberals at the CIA. We also know that Brennan has made no secret of his opposition to Trump and Flynn. By opposing Brennan’s overtures to the Muslim Brotherhood and his refusal to grapple with the spread of Islamic terrorism, Flynn became enemy number one in the eyes of Obama holdovers at the CIA. 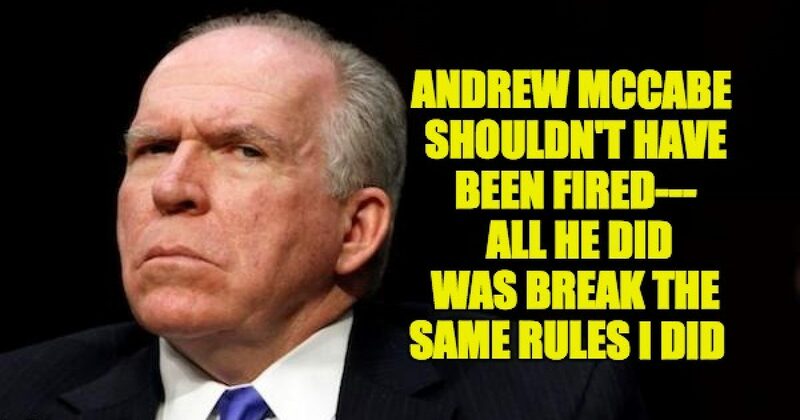 All this explains why Brennan had such a harsh reaction to Andrew McCabe’s firing because if McCabe lost his job for not being honest and leaking to the media, despite the fact that he is out of office Brennan too should face some disciplinary action….perhaps a cut in pension, or at the very least a permanent layer of duct tape covering his mouth.